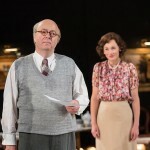 And thus begins David Hare’s newest offering- the five-handed telling of the foundation of Glyndebourne, the opera house devised and bankrolled by the public-spirited if obdurate John Christie (played by Roger Allam) and his much younger wife, the Canadian soprano Audrey Mildmay (Nancy Carroll). The beguiling production is directed by Jeremy Herrin, who also directed The Tempest at the Globe in 2013, in which Allam played Prospero. David Hare and Allam go back some time as well– in 2006, he played Lambert Le Roux in Hare’s satirical play Pravda at the Chic hester Festival Theatre. For this production, Allam, sporting bald wig and spectacles, trousers pulled up approximately to his armpits, plays the vivacious and demanding Christie to perfection. Fits of (occasionally childish) temper are mellowed by the sense of his genuine passion for opera, his absolute adoration of his wife, and a fair helping of noblesse oblige, with a smattering of a curious mixture of arrogance and ignorance mixed in for good measure. Christie is a man of privileged myopia. As a soldier trapped in the trenches of World War I, he read poetry to his men and simply stood above the parapet and looked on when curious about what caliber of shells the enemy was using. In the late 1930s, he travelled extensively in Germany, and claims to love the country, but has no idea of the terrors inflicted on its citizens, noting only the efficient traffic systems and people. He worships German opera and opera houses, but remains ignorant to how they work. In each of these things, Christie represents the benevolent dictator of the period’s ‘ruling classes’– one of those men who “knows what he’s talking about” in a variety of subjects… at least in his own head. Christie’s connections with the three men who bring his vision to life is purely a matter of chance. The beginnings of Hitler’s dictatorship in Germany led to the exile of Fritz Busch (a prominent conductor) and his close friend Carl Ebert (a first-rate stage director); displaced and disheartened, the two men are drawn into the budding opera house owner’s inescapable orbit. Carl brings along his Jewish right-hand man as a manager, and thus a production company is formed. It’s an interesting twist of fate, that this most English of institutions owes much of its founding and reputation to the incredibly hard work of three immigrants, and it is an incredibly timely reminder that the greatness of Britain owes much to those it attracts from afar. Christie dreams of opening with Wagner’s Parsifal, which is immediately vetoed by his new artistic team, who propose, to his abject horror, the “samey” and “jangly” Mozart– a man who, Christie admits (grudgingly), is a genius. “But,” he wonders, in a fit of passionate exasperation “Is he any good? Does he have any sense of the spiritual?” By which Christie, only himself recently acquainted with carnal delights, means “Does it move beyond cheap humour about who’s in who’s bed?” It’s only when his much beloved Audrey reminds him that her voice is better suited for Mozart’s closer, more intimate operas that he caves. In fact, it is Audrey who comes to the rescue during some of the shakiest times of the opera house’s formation. Her graciousness and intrapersonal skills mellow and counter Christie’s fits of bombast (and often, petulance). She acts as the moderating force between her husband’s idealism and the practical realities of “the staff,” and translates his nuanced democracy for those who see something more sinister in his quasi-authoritarian rule. As the play progresses, their roles are reversed as an unnamed illness ravages the singer, forcing her to undergo multiple surgeries and ultimately leaving her unable to perform. She greets this decline with something less than equanimity, bemoaning the career that might have been had she not been swept up in Christie’s wake, and he ends up being the one soothing her outbursts of temper and despair with heartbreaking steadfastness. 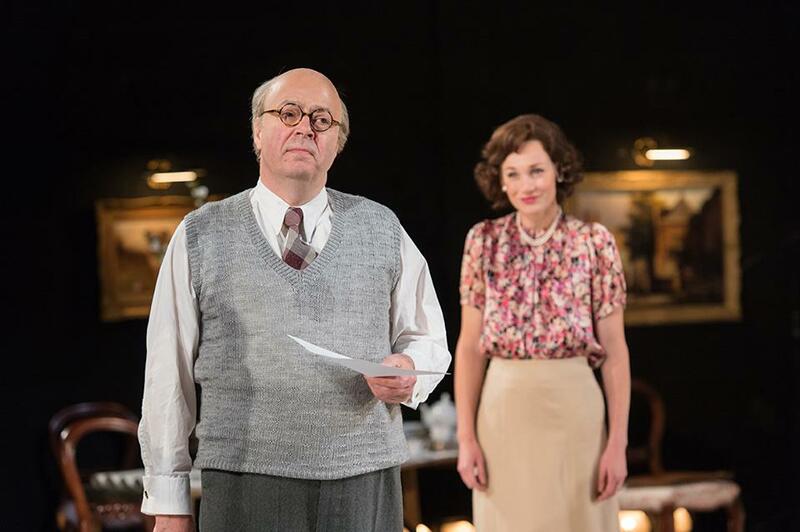 The masterclass in emotional nuance from both Allam and Carroll, juxtaposing Christie’s quiet grief for what he will lose with Audrey’s weeping for what she has lost, moves the theatre from quiet humour to absolute silence in just the space of a few lines. As Christie cites the long list of operas performed at Glyndebourne– always Mozart, never Wagner– the play transforms from a comedy about a man’s foolish passion for opera to a tragedy of unrecognized sacrifices one makes for the sake of love. “I gave my life to Glyndebourne,” Audrey tells him. “I loved you, Jack.” “I know,” is all he says in return, a realisation that comes decades too late. 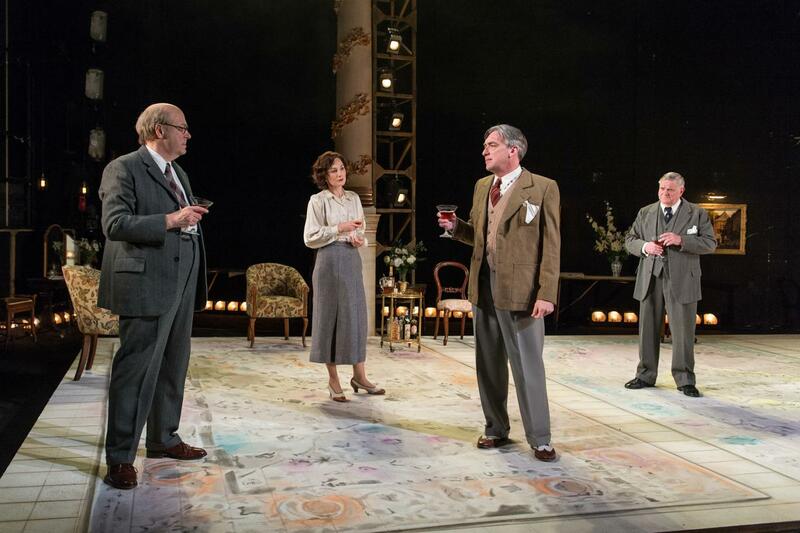 The staging and set design are much like John Christie himself: direct and unambiguous. At times, the characters literally take sides in arguments, or are outnumbered and outflanked, surrounded by the weight of the opposing opinion. The backdrop is simple, with heavy clouds crowding above the sketched flowers of the garden, to give the vague impression of substance- echoes of the lack of detail to Christie’s original idea. The stage design, too, is minimal but effective; in fact, nothing tells the story of Christie’s inflated opinion of his idea of art so much as the meticulously rendered oil painting of a pug on the wall. 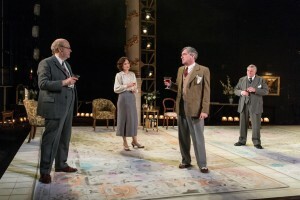 All in all, it’s a sometimes painful look at the machinations behind an ambitious quest to create an English operatic tradition to rival Europe’s, wonderfully acted by a superb cast and is a fitting tribute to the memory of a British cultural institution. P.S. Glyndebourne finally did a production of Wagner, in 2011. 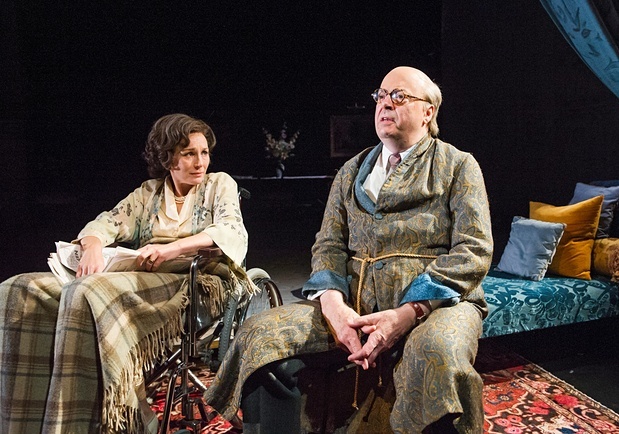 We’re relatively certain John Christie rests a bit easier now.